Whether you are looking for fine dining in a restaurant, delicous home-made pub food, a meal and drink in a bar, or perhaps a light lunch and a cream-tea in a cafe, the Isle of Wight has lots of places to choose from... often with a good view too! 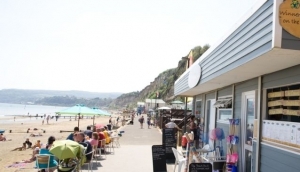 Isle of Wight restaurants offer a wide variety of cuisine to suit all tastes. Food and drink on the Isle of Wight is not hard to come by, although thankfully there are very few large chains to be found. Isle of Wight places to eat are often independently run, with home-made food prepared on the premises, usually meaning better quality food and service!Traveling from abroad? While you are here, make sure you try a hearty traditional English Breakfast to set you up for the day - perfect as a brunch if you are not a 'morning person', but not for the faint-hearted! Being surrounded by the sea, seafood is always a good bet on an Isle of Wight restaurant menu - check that it is locally caught first of course. However, some Isle of Wight restaurants and pubs serve local island produce from nearby farms too, so an Isle of Wight steak or a lamb shank is essential! Finally, you can't leave without devouring a scrumptious 'cream tea' - a traditional English afternoon snack consisting of a cup of tea and scones with jam and clotted cream.